Our Open House this year is the weekend before Memorial Day in May.. We will have tours, kit displays, hands on riveting, and grilling burgers and hot dogs for lunch. Mustang pilots that fly their planes in are treated to lunch. Complimentary lodging for Mustang fly-ins is available on a limited basis if arrangements are made in advance. A shuttle runs from the airport terminal building to the factory (where the lunch is) until 5pm Saturday. Information and Maps to the airport will be at the lunch sign in table located at our building on 1990 Heide Dr in Troy. 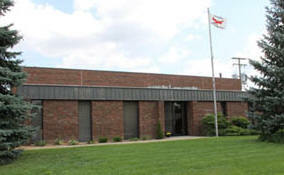 Most of the activities take place at the factory. Saturday night we will be going to Shields Bar and Grill around 7pm for dinner. Shields is between our building and the airport. For those flying in early, rides will be available from the Oakland Troy airport. We can pick you up and drop you off at your local hotel Friday, Saturday, or Sunday. Call to make arrangements. Visitors flying in commercial to Detroit Metro airport a rental car will probably be the easiest way to get to Troy. It is about 25 miles and expressway most of the way. The simplest route is I-94 east to I-75 north. Exit at Big Beaver Rd (16 mile rd) and head west 1/2 mile to Crooks Rd where you will need to be in the left lane. Go past Crooks and make a "U" turn at the turn around. Go south on Crooks 1 mile to Maple Rd and turn left at the light. Heide Dr runs north off of Maple about 1/2 mile east of Crooks. It is the first traffic light east of Crooks. 1990 Heide is on the east side of the street and will have our Mustang flag flying out front. We have special pricing on info packs, videos, CD-ROMs, drawing sets, starter flap kits, shirts, and hats. A registration packet also contains a coupon for up to $150 off a kit order. We have been getting asked about transportation from Detroit Metro Airport to our facility. The best option will be to rent a car. Since there might be people arriving and departing at similar times we are taking contact info from people that might want to share a car. We will try and put you in contact with someone arriving at a similar time. 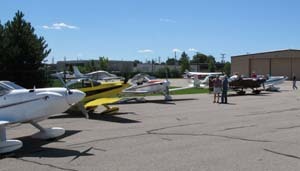 Here are some pictures and info from previous Fly-Ins.